Furniture forms the major part of the entire home décor. There are many other decorative pieces and furnishing that add to the look, but the furniture pieces always dominate them all. The design of furniture has evolved over years. The bulky furniture is slowly replaced by sleek designs. Similarly, many replacements for wood are also entering the market. Though there are many new entrants in the furniture designing, the one on the top is definitely “WOOD”! 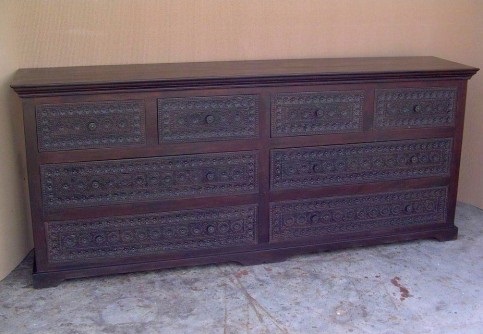 Wood is graceful, durable, and easy on maintenance, hence it is mostly found in furniture designing. However, designing experts have also explored more options to complement the popular wooden furniture with style. Here are the 5 popular materials usually used in furniture making and the ways to care for them. As already mentioned, wood is one of the majorly used materials in furniture making. Wood has been the primary material in furniture making from the royal times. The main advantage of using wood in furniture manufacturing is that it can be used in creating different designs by using it alone or in combination with other materials. It is neutral and goes well with all other colors and décor. 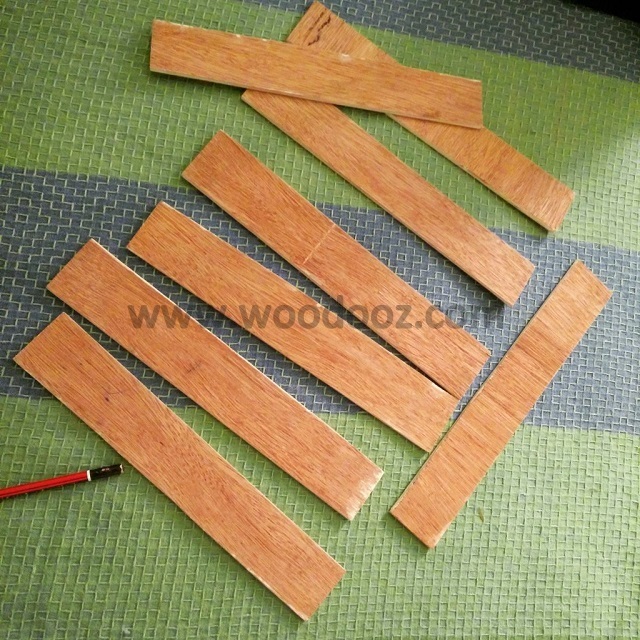 There are different types of wood like Redwood, Teakwood, Mahogany, Cane, Mango wood, and various other varieties used in manufacturing durable furniture. Avoid direct sunlight and moisture contact. Apply wax coating to keep the surface scratch proof and shiny. Carry out regular cleaning with dry cloth. Plastic furniture is the best option for outdoors. It is lightweight and can be moved as required without any hassles. 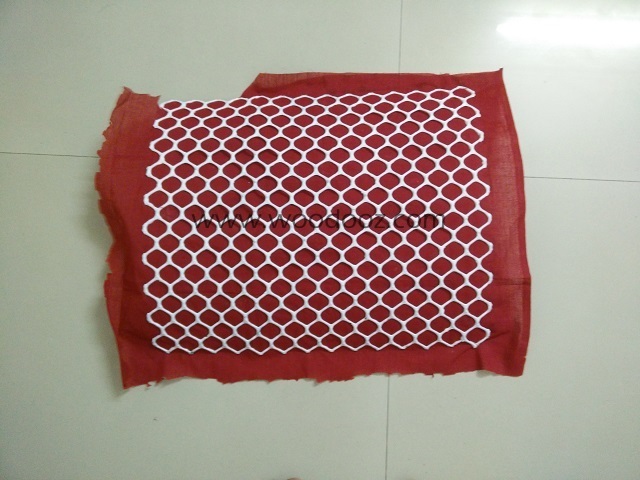 It is quite durable and can be used even in rain. Plastic furniture is available in various colors to get the vibrant décor, but over exposure to sunlight and other weather conditions would result into fading of color. Continuous sunlight would also make plastic furniture brittle. 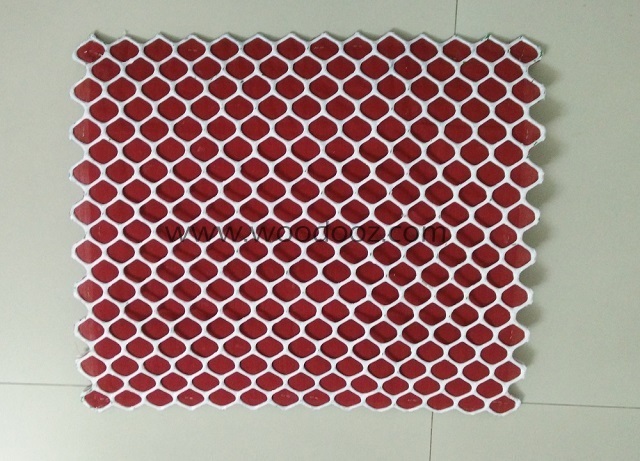 Can be cleaned with water and mild cleaning agent. Dry it completely after cleaning to avoid water marks. 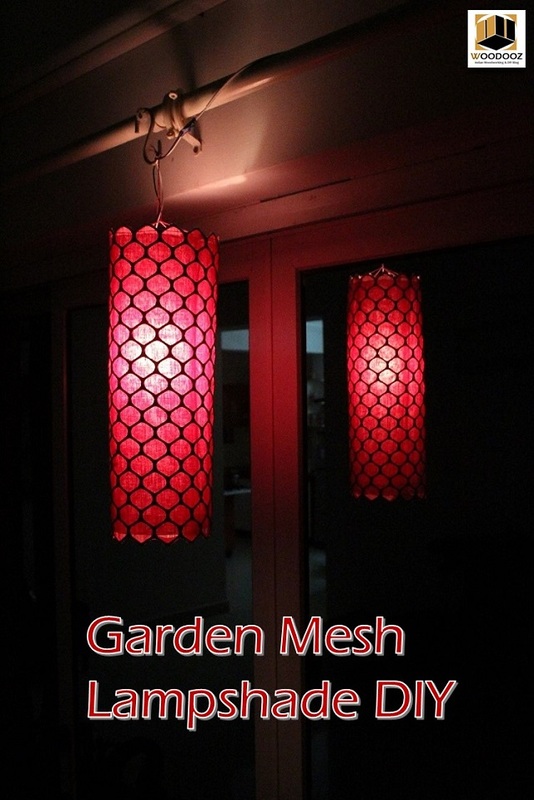 Avoid constant sunlight to increase the life of the piece of furniture. Indulge into frequent cleaning as more you let the dust to accumulate, more it would be tough to clean. Metal furniture is slowly taking the front stage due to its cost effective nature, malleability and durability. Stainless steel has found a major place in outdoor furniture designs as it withstands all weather impacts well. Steel furniture stays new even when exposed to sunlight and rain. Other metal furniture types include wrought iron and aluminum furniture. Aluminum is again quite durable as steel, while wrought iron furniture may undergo corrosion if its paint coating is damaged. Wash with mild soap and water. Dry it properly to avoid water marks on steel and aluminum, while corrosion in case of wrought iron furniture. Apply automotive wax and mineral oils on wrought iron furniture pieces. It is rare to find a furniture piece made of only glass, but it is very natural to find glass in combination with other materials. The transparency of the glass is main reason for using this material more in wardrobes, showcase, book shelf and crockery unit. Glass can be cut in any shape and size, which makes it ideal for shelves in cupboards. 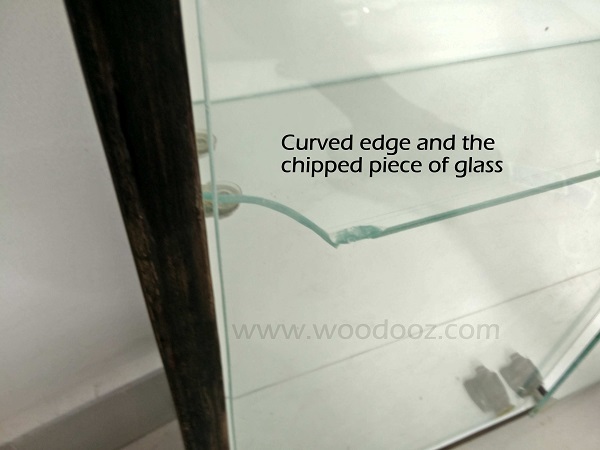 Use of glass is also found in tables and other decorative furniture pieces, as glass is not bulky and may not obstruct the vision due to its transparent nature. Glass is fragile, so handle it with care. It can be cleaned with mild soap solution and water. Use paper to wipe the glass for keeping it free of stains. Don’t put very heavy, hot, or sharp objects on glass table. You can use a mat to stay safe. Looking for the furniture that takes you near to nature then cane is the solution. 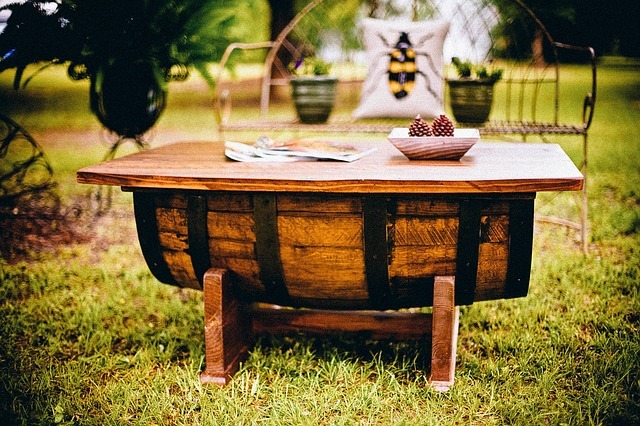 This is one of the most durable and natural form of furniture materials. 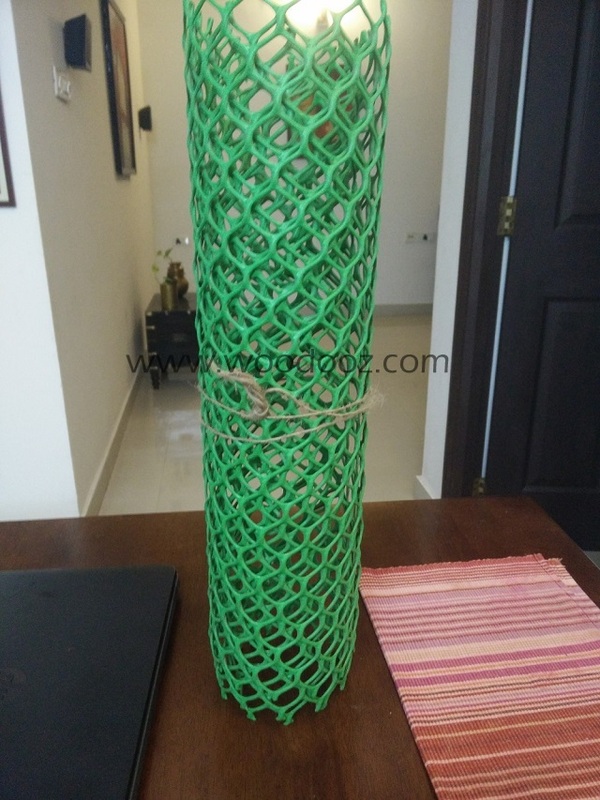 The main advantage of cane is that it can be used to make varied designs due to easy bending into different shapes. Cane is affordable, easy to maintain, and good on looks. 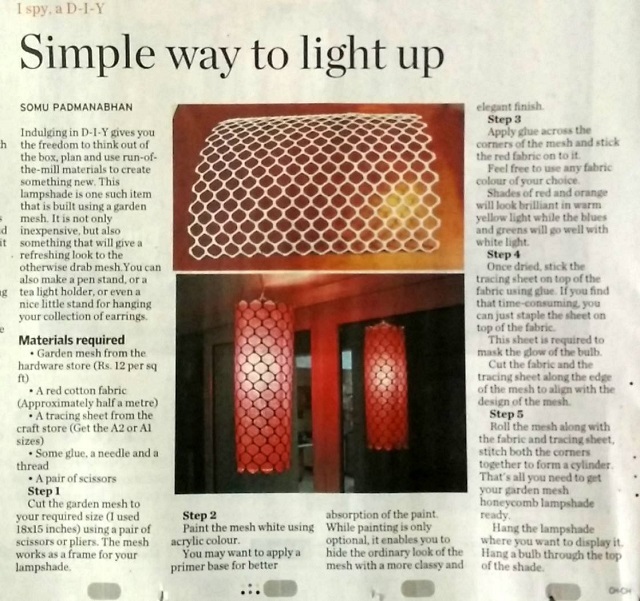 It will offer an instant makeover to your interiors and exteriors both. Clean regularly with dry cloth. For cane seats, put a cushion over it for even load distribution. Use glass top on cane tables. Decorate your home with furniture made out of different materials and ensure that you take proper care of the same to have longer life and better utility. 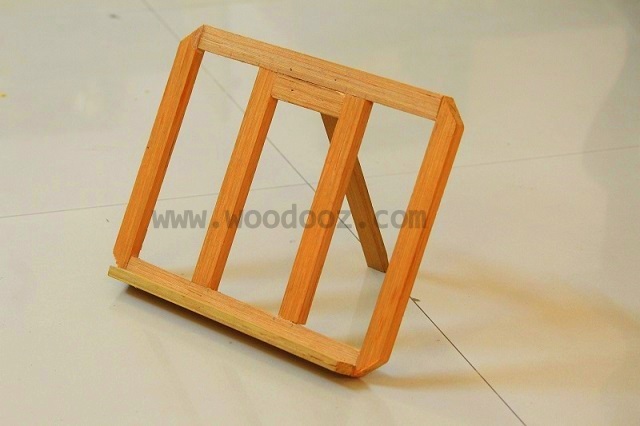 Worldcraft Industries is a furniture manufacturing company based in United States. 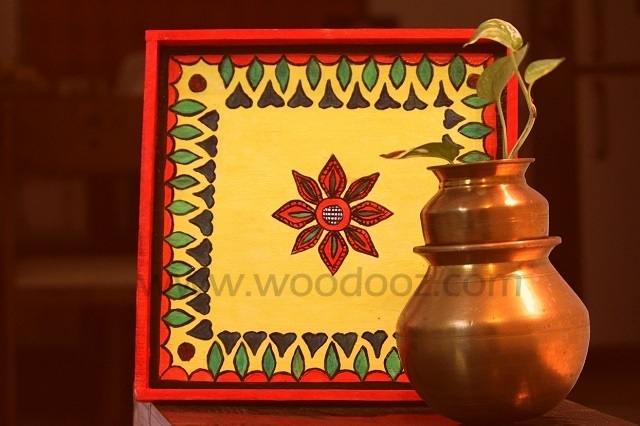 They are known for distinct Indian designs and styles. They have different collections of products like bedroom furniture, curtains, pillows and decorative artifacts. Am surprised that I had yet not put up this post. The video has been more than a month old and just noticed that it has not been up on the blog. Well, this is exactly why you should subscribe to TheWoodooz YouTube Channel. 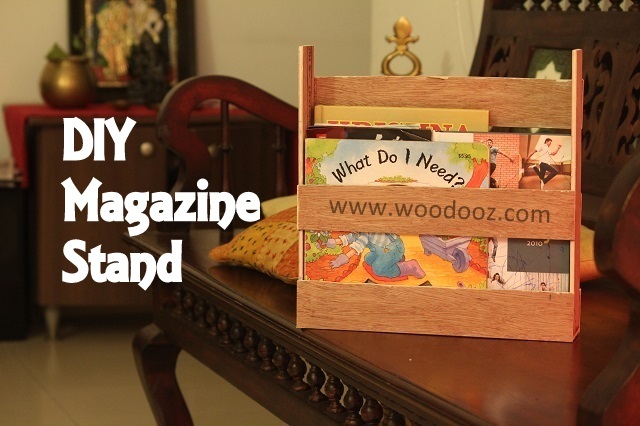 I had requested on Facebook if there was any particular project that I can DIY on a video and this Cook Book Stand request came from Dr. Sonia who is a very talented crafter. 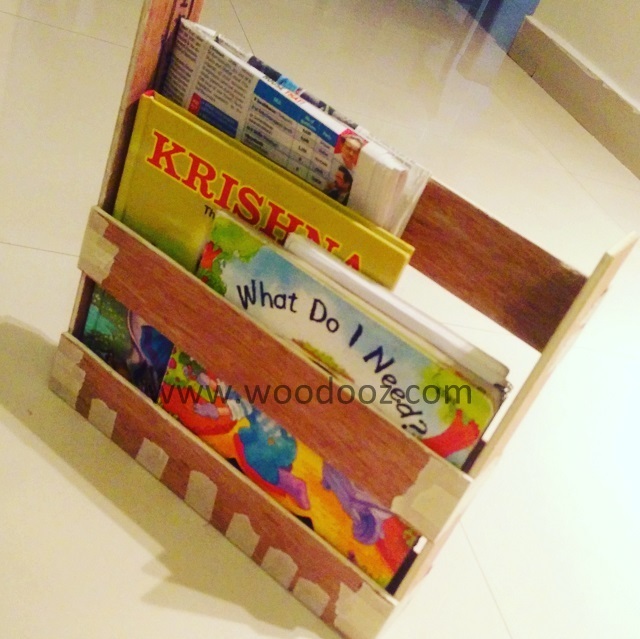 Do check out her blog Cards, Crafts and kids projects which has some wonderful crafting ideas and tutorials. Coming back to the recipe book project, I wanted to keep it a simple and easy DIY using only glue and nails and a hacksaw blade. The video is self explanatory and so I am only leaving you with images. As with most other small projects of mine, I used only these wooden beading sticks to make this stand. I am working on the next video and soon it should be up on my Channel. Meanwhile, if you have not subscribed to TheWoodooz YouTube Channel, I urge you to click here now and hit the SUBSCRIBE button. Go on. Do it rightaway. Until next time, happy DIYing. I once walked into the plywood store and asked, "Can you give me some waste pieces of wood. I will pay for it." Instead of given me pieces of wood, the store owner gave me a piece of his mind. Ever since, I have come to understand that no piece of wood can really be useless. The smallest of small pieces come in handy when you least expect them to. Even saw dust is useful as a filler for your projects. Even since, I have this habit of hoarding wooden planks in the house. Sometimes in the boot of my car. So, when I did my workshop recently, the participants left behind cut strips of wood, I didn't have the heart to throw them away. I brought them back home and have been itching to make something out of them. I wanted to live the example especially when I keep telling others that no piece of wood is worth discarding. And that is how this project came about. 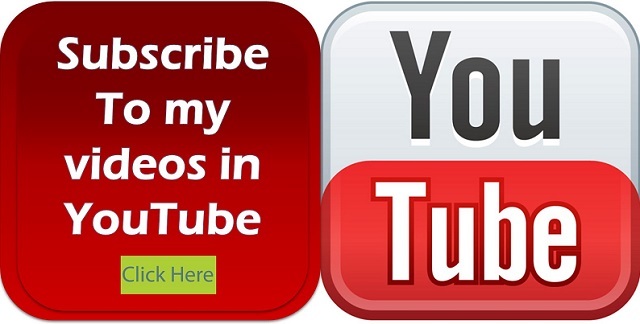 Have you subscribed to TheWoodooz YouTube Channel. If you like this post, please subscribe now. 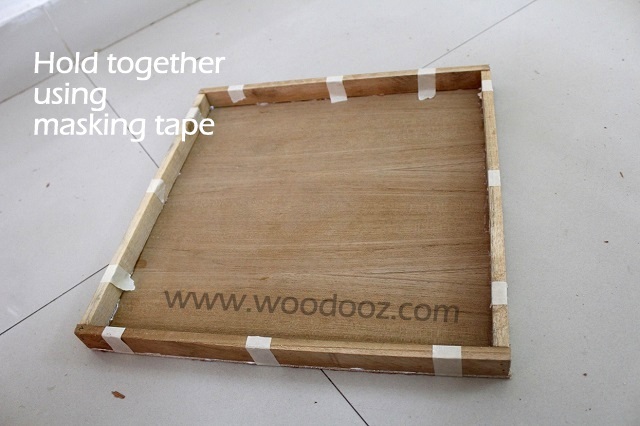 There were 7 participants and each left behind a 2 inch x 12 inch strip of 6mm plywood. I had cut one strip as part of my demonstration and so I had 8 of these. The idea was to make something purposeful without having to use additional materials or modify the strips. We initially wanted to make a clock. However, I wanted to use all the 8 pieces and not cut any of them. And so the Magazine holder plan emerged. 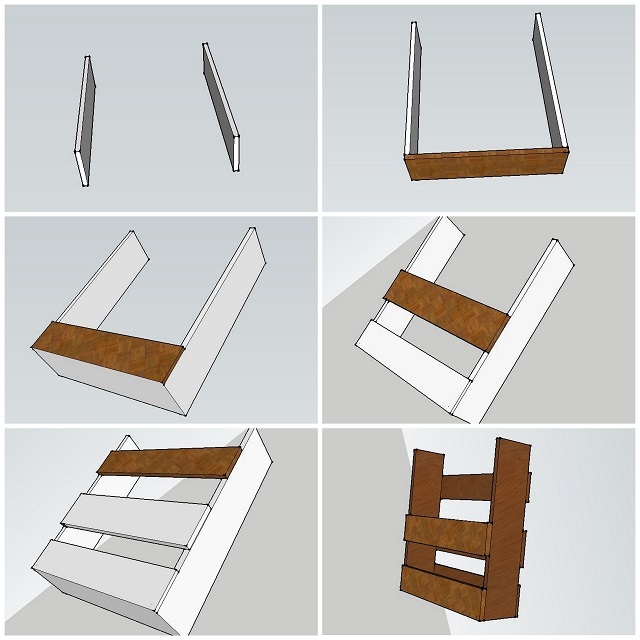 While the video below explains the step by step process of making this Magazine holder, here's a Sketchup illustration. I did not want to add colors too as I liked the texture on the ply. So just sanded it off using 120, 150 and 180 grit sand papers. I am back with another video. But before that, wanted to take a moment to share a wonderful news that can do loads of wonders for whatever I am trying to do here on the blog. Social Samosa along with Asian Paints opens the gates for the first ever India’s Décor Influencer Awards (IDIA) – an initiative sculpted to accost the contribution of influencers in the digital hemisphere. And guess what !!! 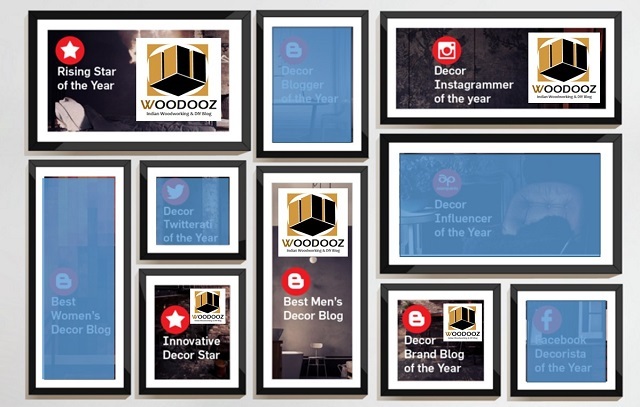 Woodooz.com has been nominated in 5 distinct categories. Fortunately or unfortunately, it boils down to the number of votes the blog can garner for the jury to come to a conclusion on the winners. And hence this request. Meanwhile, here’s what we have been up to. 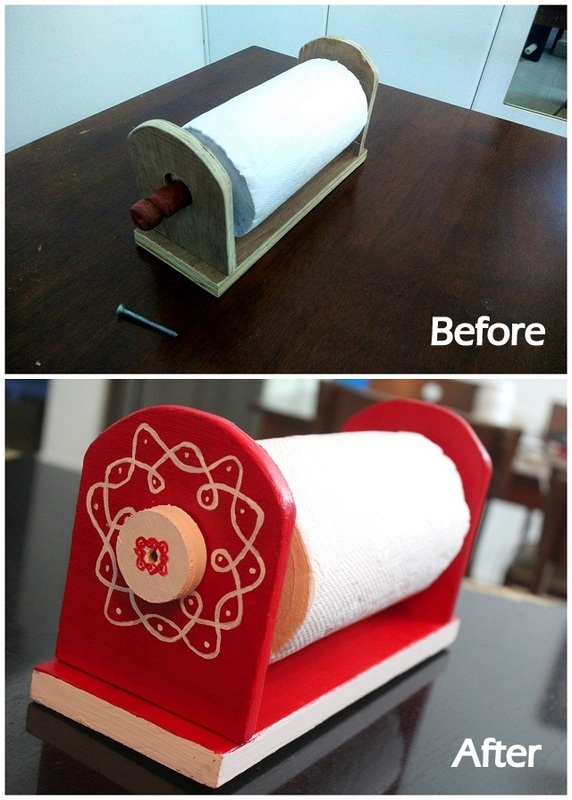 We have been wanting a paper towel holder for a while now. The little one is still not 100% potty trained and we have been using up loads of these papers on and off. So having it readily available on the kitchen counter became the need of the hour. Please do watch this video on the step by step procedure on how this was made. Our Kitchen cabinets have a combination of bright red and white. And so when it came to matching up with the existing scheme, the choice of colors was evident. 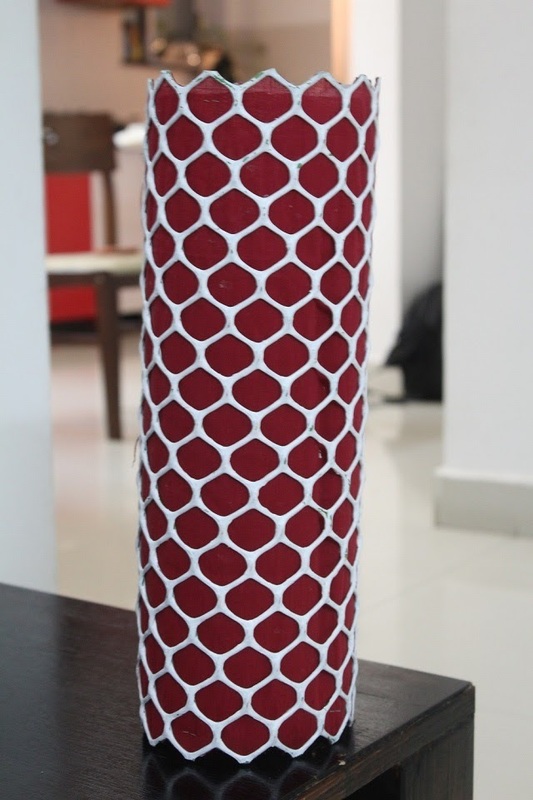 Furthermore, we are also working on an overall traditional decor for the home, which made the design on the holder even more evident. 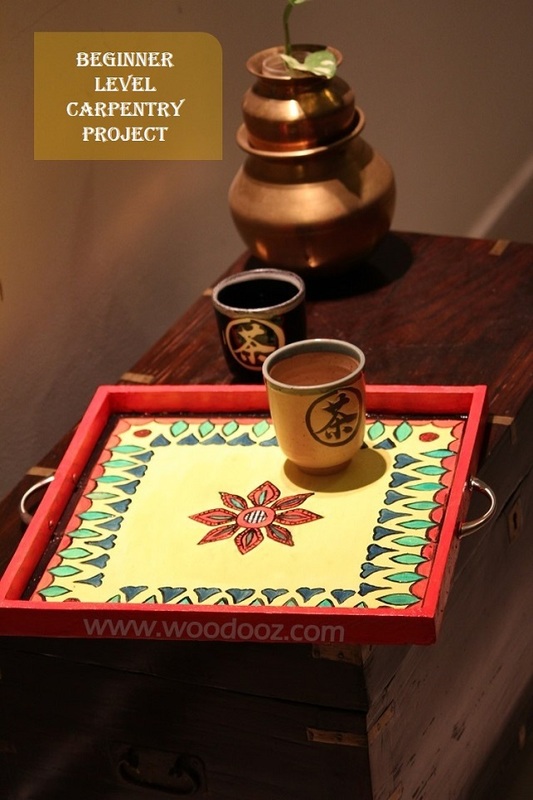 The design, the color scheme and the execution – All Preethi’s handiwork. All I had to do was to give her the holder made in Plywood. While the video explains how this was made, I shall leave you with some progress shots of the project. Meanwhile, it would be great if you can reconsider voting for me, just in case you came until this point without casting your votes. I shall meet you soon with another project and I expect feedback from you that can help me improve the quality of my next video. Please leave me a comment. Note : Please check our Staining wood series also which uses a different staining method from what is explained in this post. Adding color to wood is like the icing in the cake. You mess it up, and all the efforts taken to bake the cake goes waste. And so it becomes one of the most critical part of completing a project is to make sure you give it the desired color. 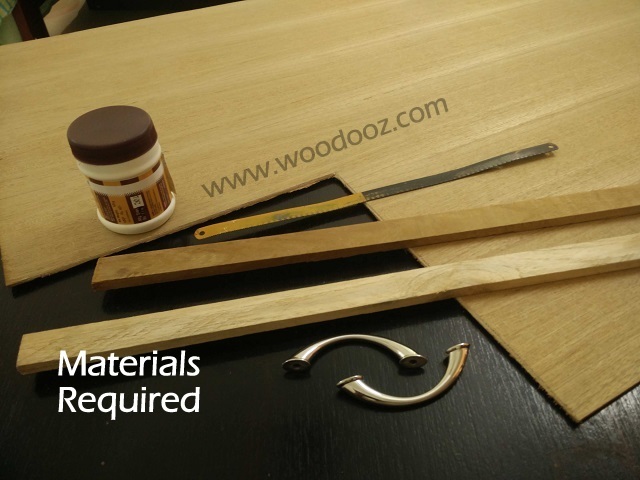 While there are many methods used in giving color to wood, and we have also seen a few in Woodooz, one of the common methods is to use wood stains. When I started looking for means to stain my first ever project, I was clueless. And it was a professional carpenter who taught me how to use sealant and stain.We have already seen in detail the procedure for applying stains using sanding sealers as base coat. Another variant which I was taught by another carpenter was using wood fillers and stains to give that much needed color to wood. I made a short video to explain the process. I hope you find it useful. Staining requires surface preparation by way of sanding and smoothening the wooden surface. I am also posting the sanding basics video which would even otherwise be useful for folks looking at making smaller projects. Remember to leave a comment and let me know what you think. Note : Before anything, have you subscribed to TheWoodooz Youtube channel ? If not, I strongly urge you to click that subscription button right away. Up until now, there have been focus only on posts. But then I have taken it upon myself to make sure there are more and more videos of my tutorials that are available for you. 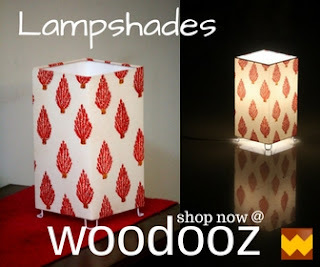 And so, I request you to join TheWoodooz channel and spread the word too. Traditionally, we do not celebrate Christmas. However, we thought the best way to have Little L respect all cultures equally was to get her to enjoy and rejoice festivals as much as Diwali and Pongal. And so the thought of having a mini Xmas celebration came up. And what better way to kick start than to have a tree in the living room during this season. Quite naturally, Preethi wanted something sustainable and easily storable. So, I decided on a DIY tree that can be easily fixed, dismantled and stashed away in the loft when not needed. I had given myself about two days time to get this done. So went around looking for materials already available. 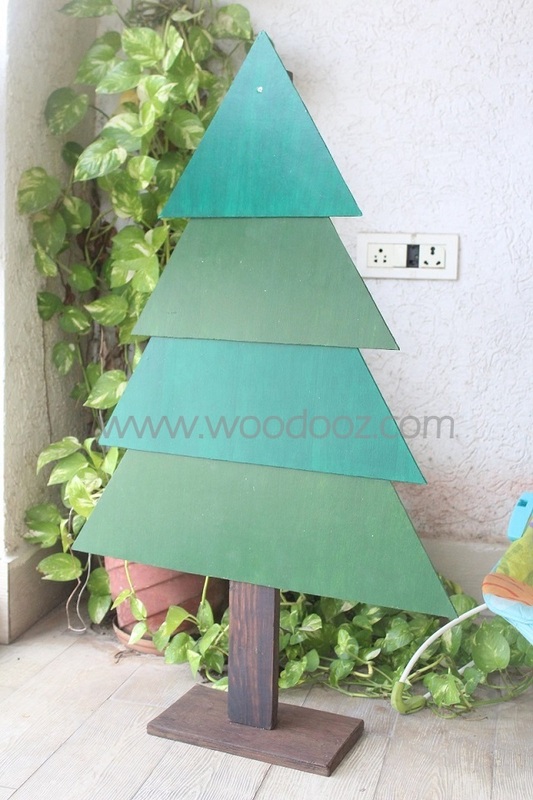 One Side Teak sheet for the tree shapes. 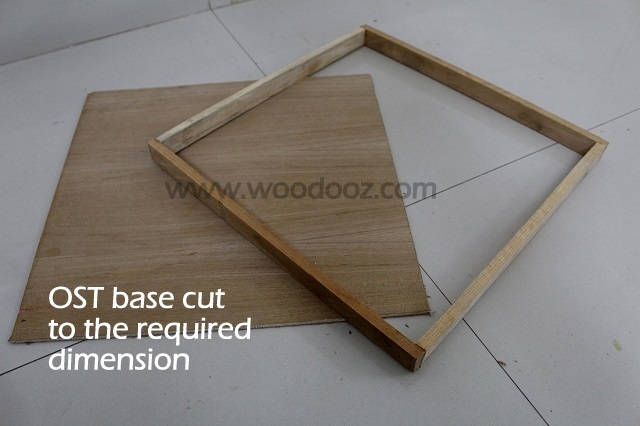 Small plywood plank for the base. And a long 3 feet stem . Incidentally, I had all of them at home which made life easier. Besides this, I have used Gesso as a primer, Acrylic colors for the tree shapes and walnut stain for the base and stem. I had finally given a coat of Mod Podge as I wanted to avoid vanish this time. A mica cutter and an electric drill are the only tools I used. While I have explained in detail the steps involved in the video above, I am leaving you with some progress shots of the making process. 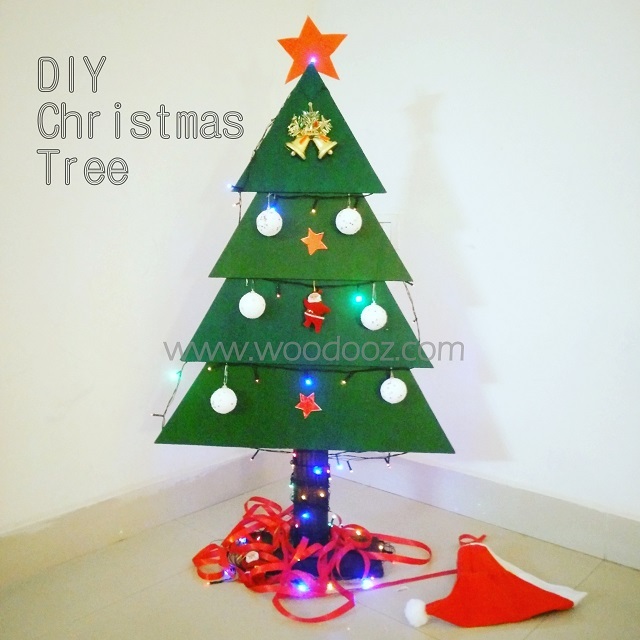 Please do watch and let me know if It peps you up to get ahead and make one tree yourself. There may not be wine and plum cakes around. But, hopefully some story telling and loads of fun is totally in store. And trust me when I say there is going to be more holiday decors and DIYs in the coming days. Imagine this. Food is being prepared. It is hot and is kept on the counter to simmer. Little L is so impatient she goes into the kitchen trying to reach her hot breakfast. On other days, she fiddles with the water can spilling water. She opens the cabinets and starts pulling out the utensils. Once it fell on her feet resulting in loud, helpless wails. The stove is on most times and that is our biggest concern. And then there are other looming dangers in an otherwise seemingly safe kitchen of ours. Sometimes Preethi wants absolutely no disturbance when she is busy and that is when Little L decides to get clingy. 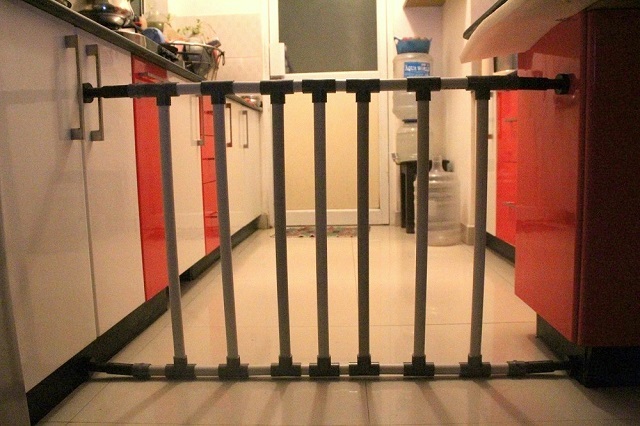 So you now know why blocking kitchen entry became our immediate child proofing requirement. And the need for a baby fence arose. We once built a baby gate for my niece. However, in my case, the strictest condition that I had to work under was there should be no drilling anywhere. The kitchen being open has cabinets on both the sides and putting a hole in the cabinets is forbidden. Hence started the NO DRILL baby fence project. I also had smaller pipes cut for horizontally joining the joints. Just pour the solution around the circumference of the pipe where is joint would be inserted. Immediately insert the pipe into the T-joint. Ensure you use proper protecting gloves as it got a little itchy for me. Also, it is recommended that this be done in a well ventilated space, which I came to know of later. Continue to fix the pipes vertically to the T-joint. 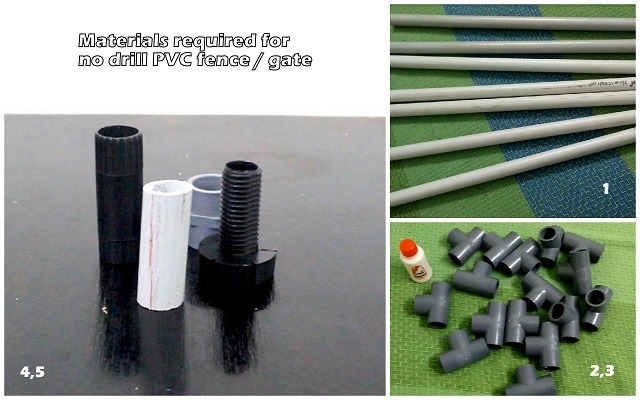 Once the pipes for the vertical section of the gate is ready, cut smaller pieces of PVC (the length will depend on how long you want the gate to be) and start joining the pipes through the T-joint horizontally. At the end of it, you would have the gate in place with an open T-joint on all four corners of the fence. 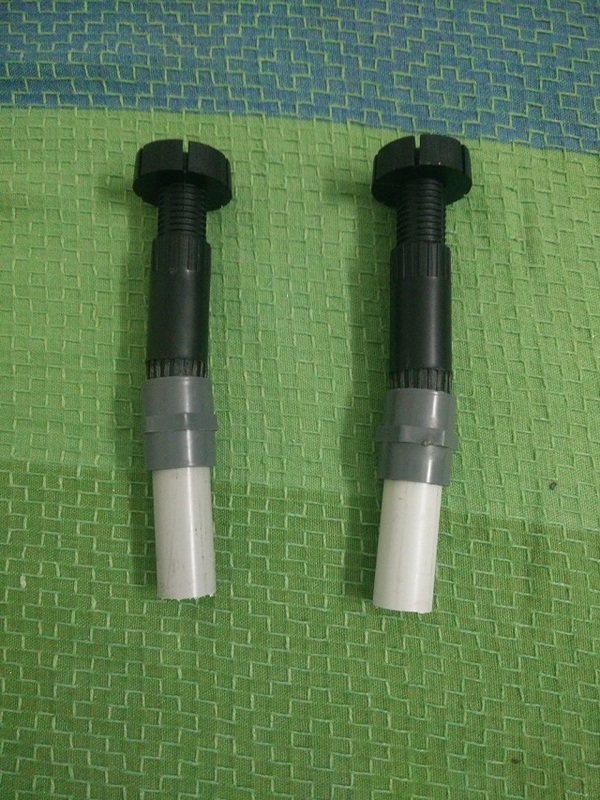 How the tightening screws are fixed to the corner T-joints using height adjustable furniture legs, PVC couplers and small pipes, while explained in detail in the video above, I will also brief it here. You can remove the base of the furniture legs and insert the female portion of the legs into the threaded side of the coupler. 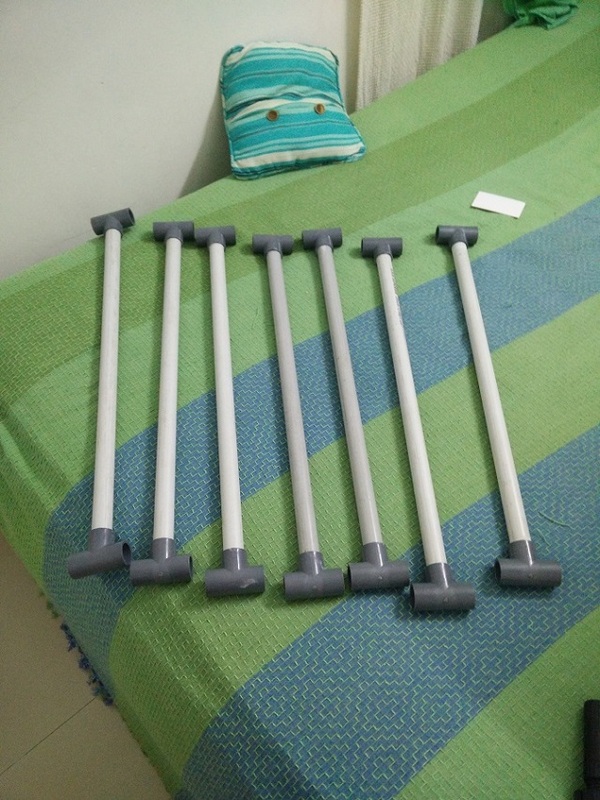 The legs exist for a different purpose and hence will not easily fit into the coupler. You will have to work hard at it. Join a piece of PVC pipe using the cement solution on the other end of the coupler. It would look like below. Now fix the PVC end of the above arrangement into the open end of the T-Joints in the four corners of the gate. The circular head acts like a screw and can be turned around to move in or out. This head acts as the tightening screw. 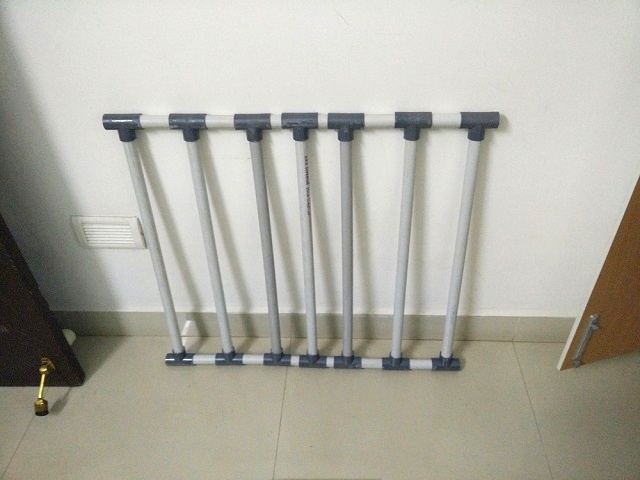 As you place the gate between two vertical wall surfaces and open up the screw head, it will go latch on to the wall surface tightly and hold the gate in place. Your gate is now ready. Install it between the two vertical surfaces and watch the fun. 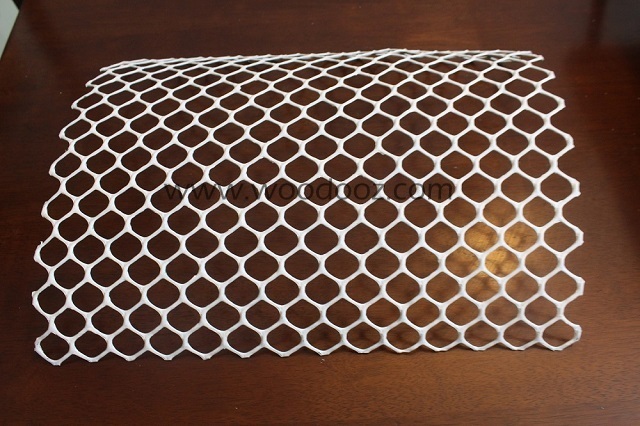 We have more child proofing projects in the pipeline. Some of it DIY and some of it using off the shelf products Either way, we shall keep you posted of the details. 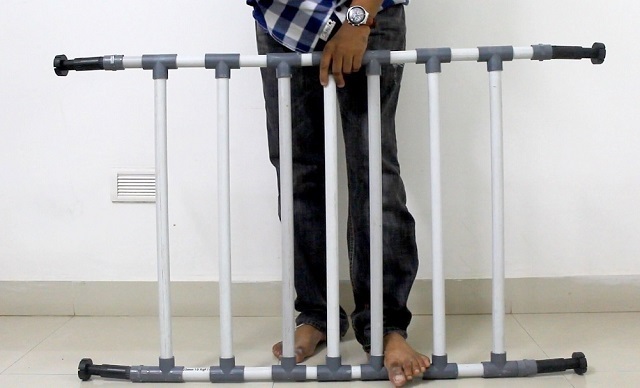 Meanwhile, your inputs on this gate would be much appreciated. What other ideas would you be able to give us in making the home a safer haven for our little one ? Do leave your thoughts in the comment. We announced the starting of the DIY Woodworking group on Facebook. Interestingly, we received good response and we are getting to consolidate the group with woodworking enthusiasts and aspirants. Already, there are useful threads around how to prepare chalk putty, and what should be the essential tools in a beginner's list. I strongly urge you to join as I foresee interesting DIY shares from folks around the world. 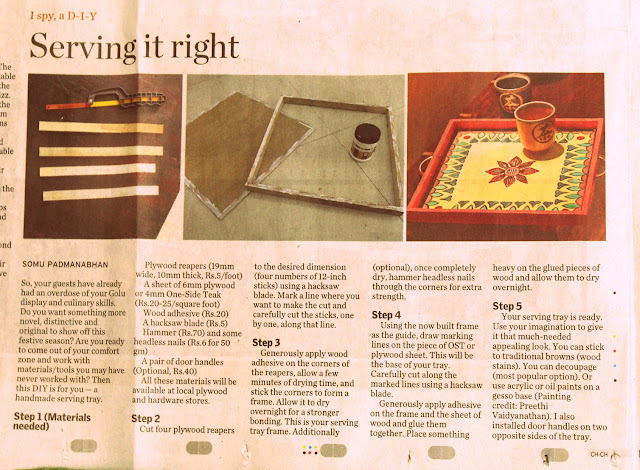 We had our first DIY woodworking tip published in the honorable Hindu Melange Metroplus Edition (17th Oct, 2015). 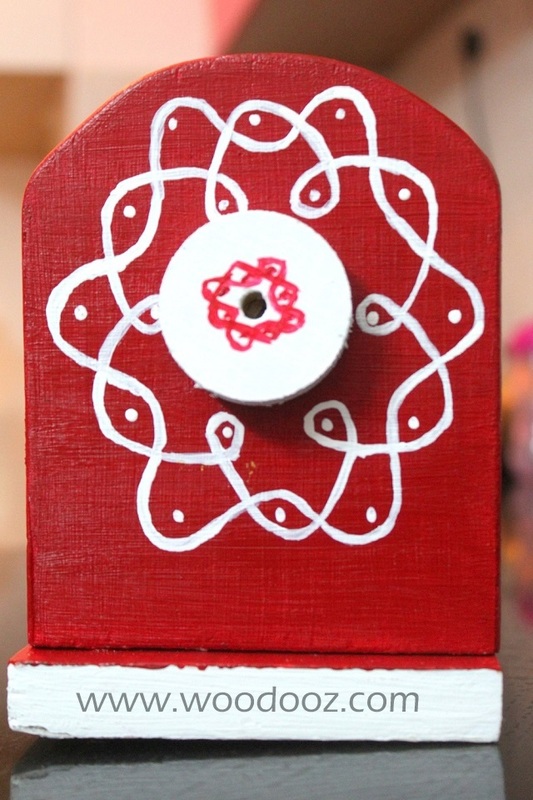 I chose a small, beginner level project that can be made around Navratri / Diwali when we have guests coming home. A DIY tray can carry a good show-off value as you can show it around casually and subtley without trumpeting about your new found hobby. 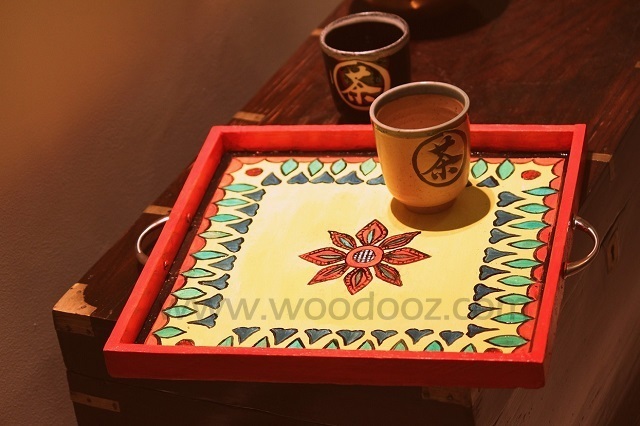 This week, I wanted to elaborate on the project - The basic serving tray you can make. The step by step procedure is already in the published content (Check image below), and so I want to focus on the photos (Published and unpublished) that by themselves explain the procedure. 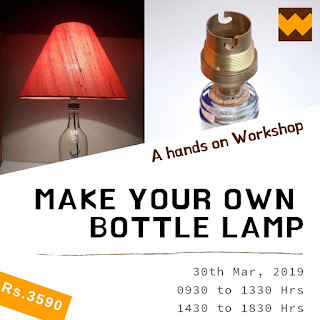 Do take a look and let me know if this is something that you would love to make sometime. Used simple materials like plywood reapers, OST / Plywood sheet for this project. Made it easier as no power tools are required. Just a hacksaw blade did all the trick for me. The size of the tray is based on your requirement. Mine is a square tray and it is 12 inches on all sides. You can make a smaller, bigger or even a rectangle tray - Just customize the size to you needs. 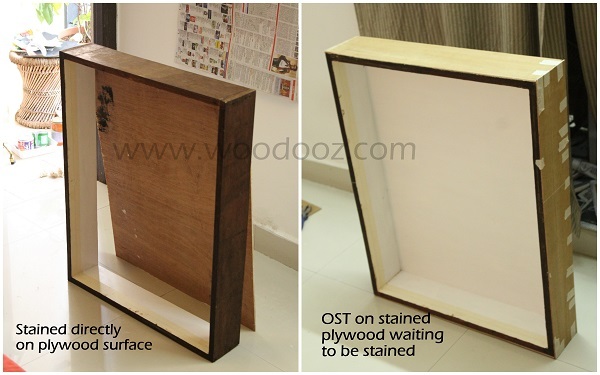 6mm plywood or a 4mm OST sheet (One Side Teak) - Both would serve the purpose. Just walk into a plywood store and ask them if they will be able to spare a sheet that was cut from a bigger sheet. 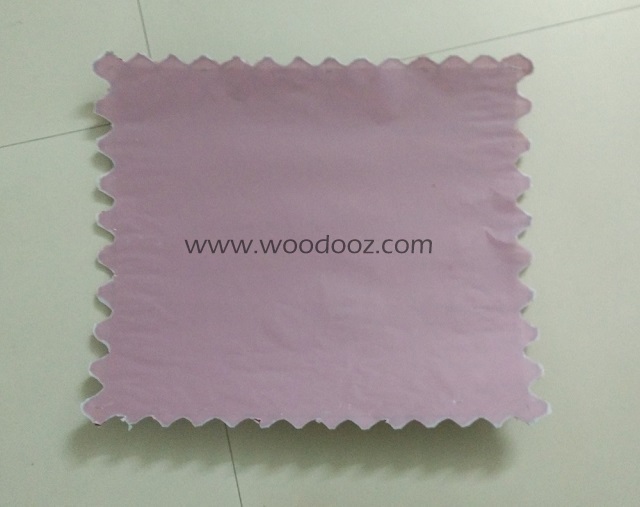 Such sheets normally never sell and the vendors would be happy to give it to you for a small cost. 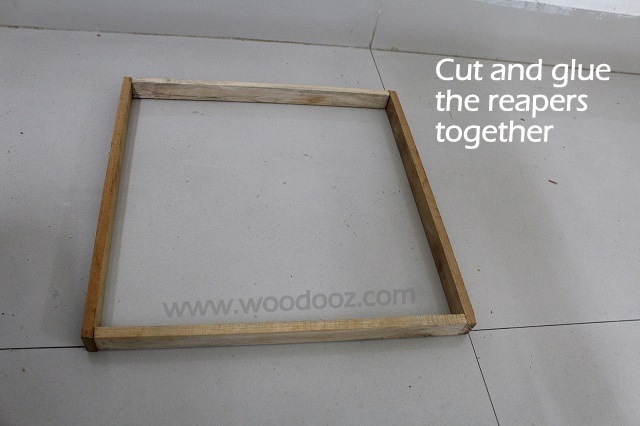 Apart from the glue, you can use small headless nails to secure the base to the frame. 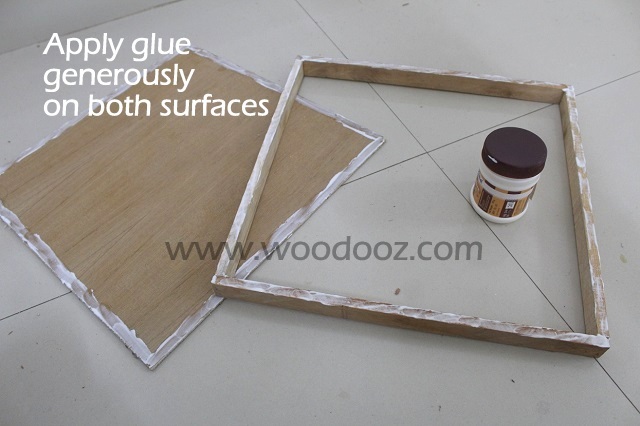 For making sure the glue bond is strong, use masking tape, clamps or just overturn the tray and place something heavy to hold the base and the frame. I use a vessel filled with water if I cannot find my tape. After the base and the frame have bonded well, I used hammered in headless nails (Optional). This is your basic tray. You can even use it without a handle. 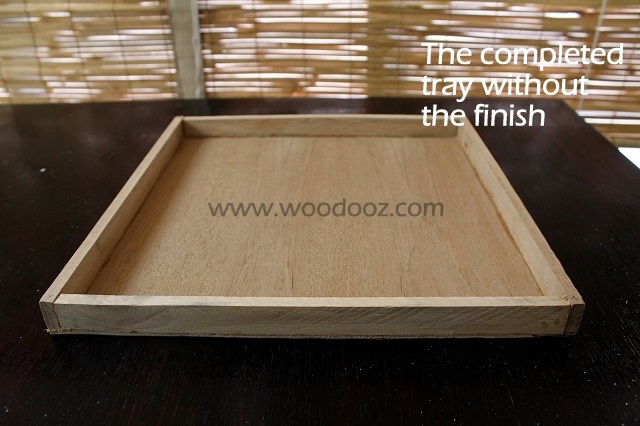 However, you need to apply the required finish for the tray to be functional. Remember, you are going to serve coffee and tea and you need means to handle the spill. Until now, whatever you see is my handiwork. I promptly handed over the tray to Preethi and left it to her to finish it up. I was awed by the outcome and I realized it is good to have an art expert at home. After all, art is not my forte. I will detail the finishing process as a separate post as this one is already getting photo heavy. It will also help break down the process without having to stuff you with too much information in one go. As a parting note, I want to tell you this. 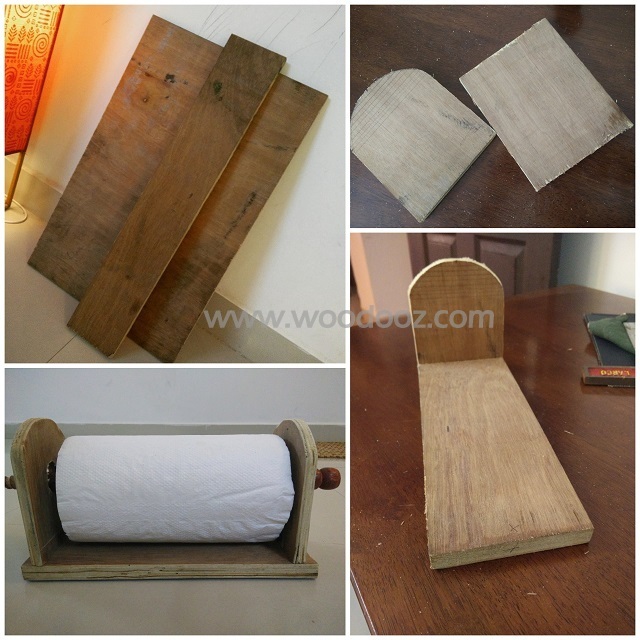 Working with wood opens up options for you to make small functional items for your home. 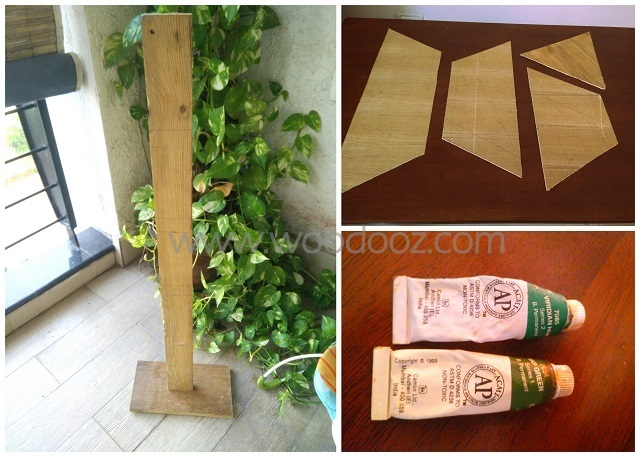 If you are hesitant, working on this DIY is an ideal first step to gain confidence. You can make your DIY a talking point among guests and items like your own tray can become conversation starters Now that Navaratri is over, try this out for Diwali. Go DIY and leave us your feedback as a comment. It took me more than 8 months to make the display case project. Not just because of other things that kept me busy, but also because of my own faults. I still remember how many times I changed the plan either because I did not like the output, or because I did not have the required tools, or plainly because I had messed it up. Most of this tremendously increased my trips to the plywood store. Something as simple as buying a white sheet of laminate only to come back home and realize I have been using oft-white all along. Some of these mistakes added to cost, and the rest of it added to the time and effort involved. By the end of it, all I could muster was a heavy sigh of relief. So here I am documenting the lessons from this project just so I keep coming back to this before I start all my newer projects. I should have decided to use a laminate for the outer surface of the shelf. I first decided to stain directly on the plywood. Somehow it did not appeal to me, and so I decided to add a layer of OST and then stain. Somehow, that did not seem appealing and I finally ended up using a laminate. Effect : Loads of wasted time and effort. I could have saved more than 10 days had I decided to directly go with laminate on plywood top. I should have decided to use a laminate for the insides of the shelf. I first attempted priming the base and then applying white paint. Total failure. Then I shifted to multiple layers of Gesso and white acrylic paint. Effect : Awesome outcome despite the wasted time and effort. But then when I started applying varnish, the whole output collapsed. Finally, went with oft-white laminate which worked in my favor. I could have easily spent about 15-20 days adding layers and layers of primer and waiting for it to dry. I should have stuck the oft-laminate first before fixing the sides of the shelf. The shelf was built and then the laminate was stuck. 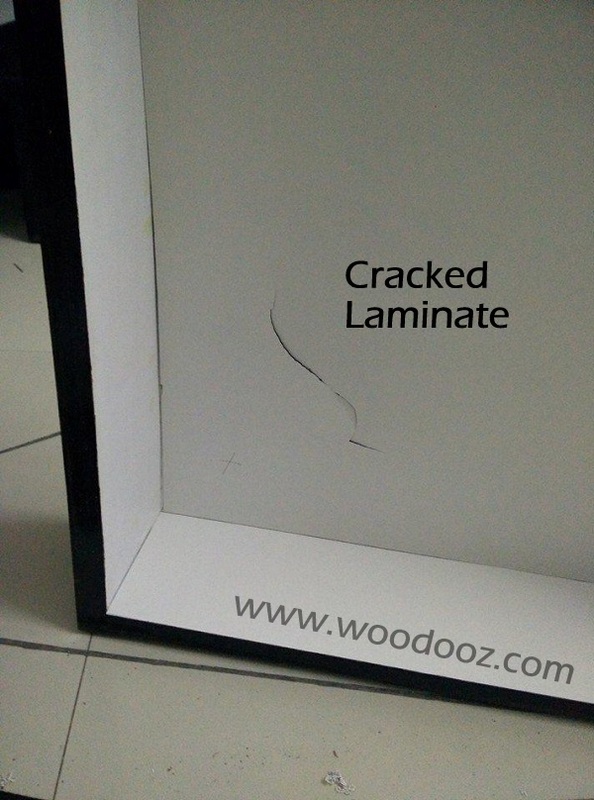 The first time I tried to stick the laminate to the inside back of the shelf, the measurement was slightly off track and when I tried to remove the laminate, it cracked. AIYO ! I should have known what laminate I was using. Despite the plywood vendor telling me that I bought only oft-white the previous day, I insisted he give me white laminate as a replacement to the broken one. I came home and realized he was right. PHEW ! 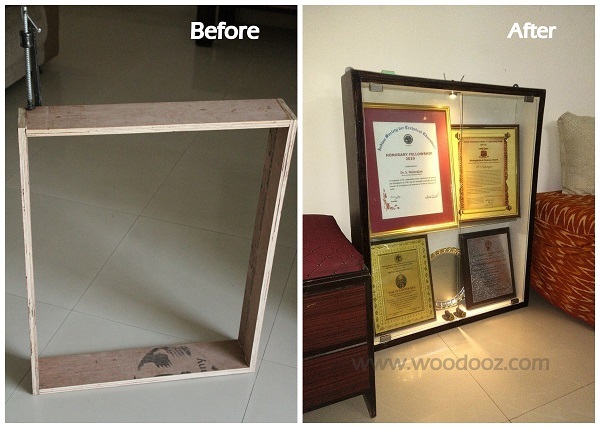 Finally the wooden shelf was built to my satisfaction and it was now time to fix the glass shelf and the glass doors. YAY ! I should have known that the glass door will rub with the glass shelf if the shelf depth was not correct. Much to my dismay, I noticed it after all the installment was done. I had to take the glass sheet to the store to cut the edges off to ensure smooth opening and closing of the door. URGH ! I should have known the glass is fragile and is likely to break when something falls on it.I was installing the door and the hinge on top slipped and fell on the shelf chipping a piece of it. Another visit to the store to shorten the depth to remove the crack. WHEW ! Finally, I bought a good looking LED focus light for the shelf. I should have known that I did not have the tools to drill a hole that big and that the drill bit was very expensive. I decided to tone down the size of the focus light (now a single LED), just so I can complete the task. Major BULB ! If you re-look at each of the points all of it point towards lack of planning which was a result of either lack of knowledge or blatant oversight from my side. While the lapses did add to cost, they have also given me a better understanding of the aspects to take care of in the future. Have to plan so that no time, material, effort or money is wasted. I am sure I will still get some of the things wrong the next time too, but with experience I will reduce the number of these mistakes. And the goal is to eventually master the art of planning before commencing projects. This post is a reminder that I should consciously work towards that. Do wish me luck and let me know if you have had your own time / effort wasting tactics in doing a project. Want a dismantleable Golu Padi for this Navaratri ? Feel the ones in the market are very expensive ? Had trouble trying to find a carpenter to get it done for you ? 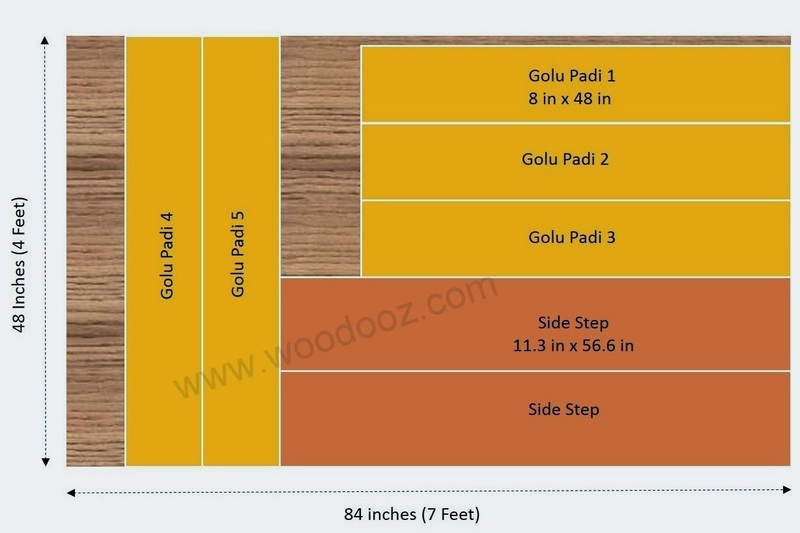 Did you land up here looking for means to build your own DIY Golu Padi right from scratch and at a much lower price ? Well, you have come to the right place. Just browse through the 3 posts from the drop down below and learn about the basic design, materials required and cost, and the assembly procedure (a video). 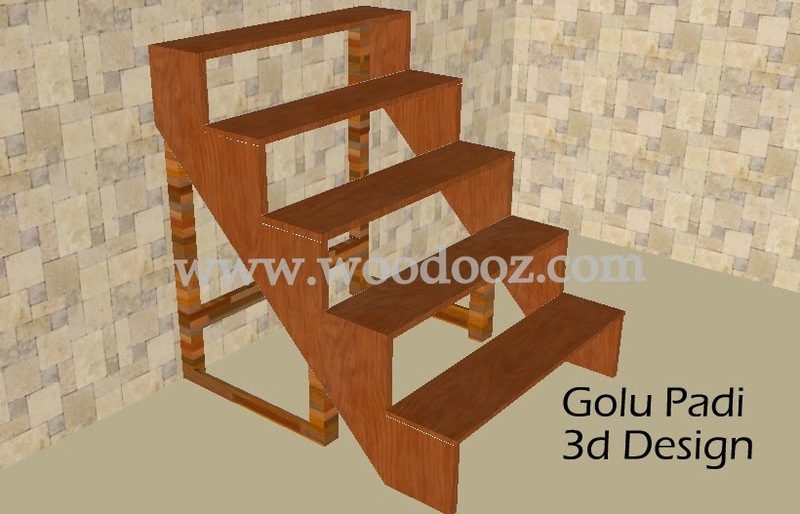 Preethi had started the Golu display at our new home with make shift Golu steps. 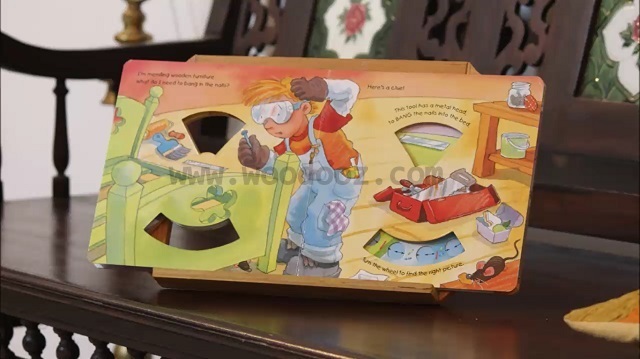 This year, we wanted something that is more permanent and easy to store and assemble. And so started the Golu padi project. Before that, I would like to thank Love and Lentil for their tutorial from which I took the design with minor additions. 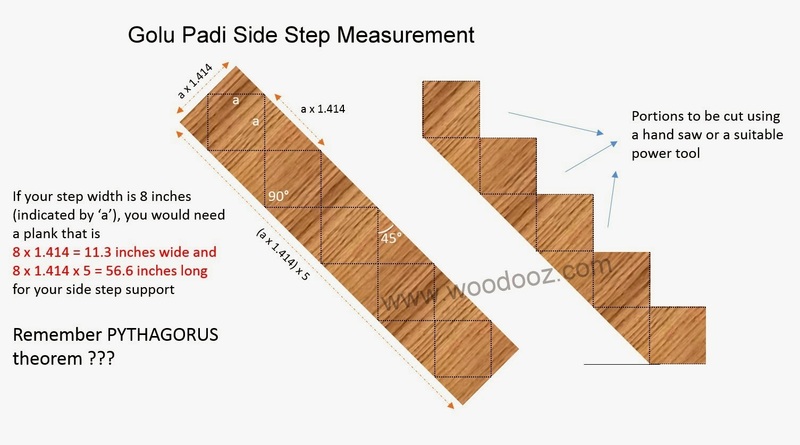 The focus of this post would be to explain how to arrive at the measurement for the side steps based on the width of each of the Golu padi. And in turn, arrive at your total amount of wood that you need to purchase. First decide on the following : What should be the height between two steps ? What should be the width (depth) of the steps ? What should be the length of the steps ? All these three decisions will be completely based on your own collection of dolls / idols. 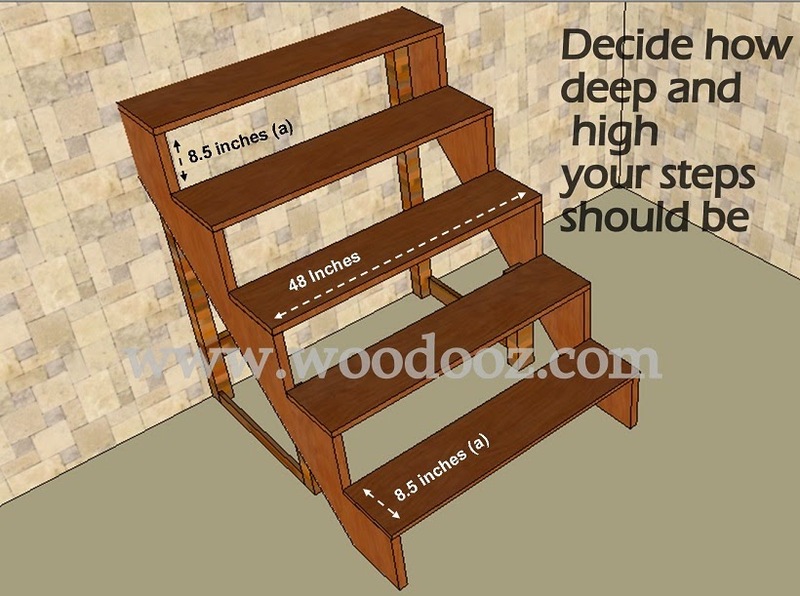 For convenience, choose the height and width (depth) to be same. In our case, we chose 8.5 inches as the height and depth. Here is where Pythagoras Theorem comes in handy. Don't really remember using it for anything functional in the last so many years. Your padi width / height (indicated by 'a') being the sides of a square, you will need a plank that is 5 times the diagonal of that square. 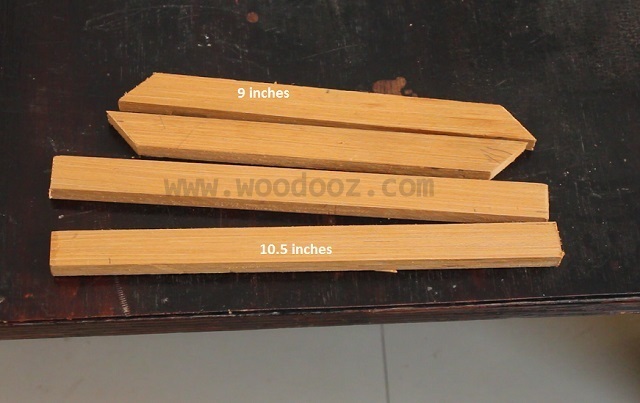 The below illustration will help you decide how much of side step support plank that you would need based on your choice of width and height. 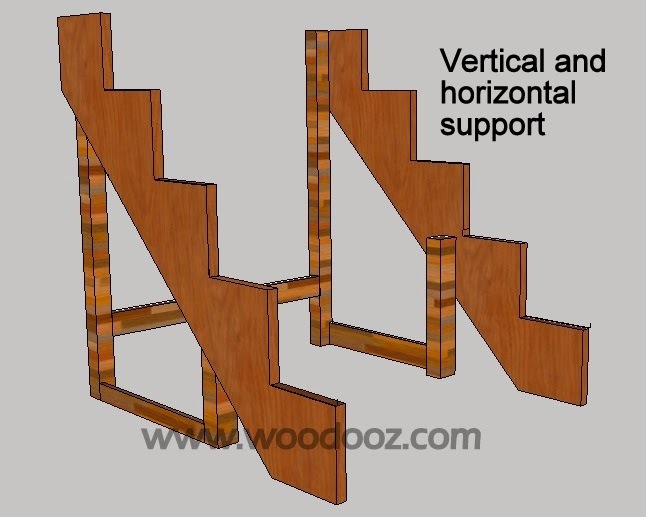 The vertical support is required to hold the structure in place without falling down. And the horizontal support is required to prevent the structure from falling sideways. Both these supports are critical to the stability of your entire structure. 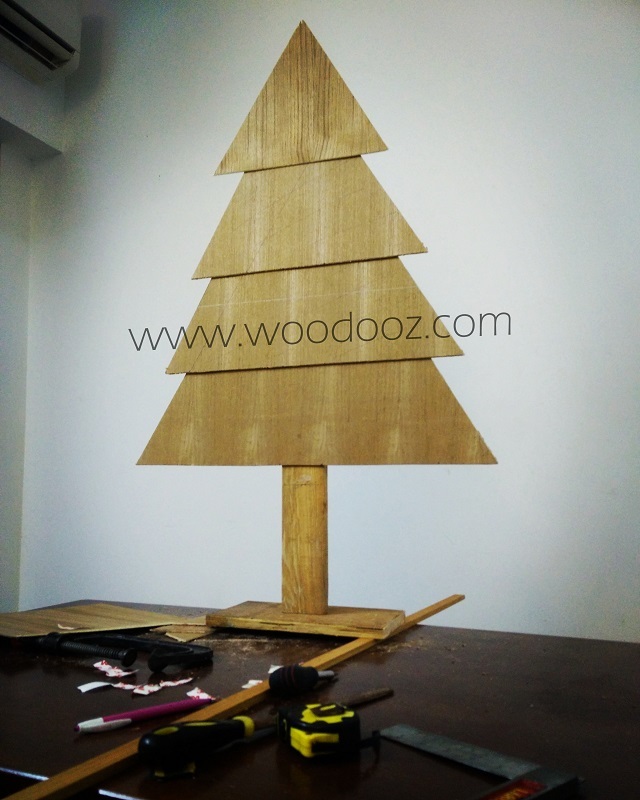 You can either use the left over wood (as indicated by the wooden texture in the above photo), or buy the required amount in addition to the 4ft x 7 ft board. The length of these supporting pieces are not provided as they are straightforward and can be derived by merely measuring using an inch tape. 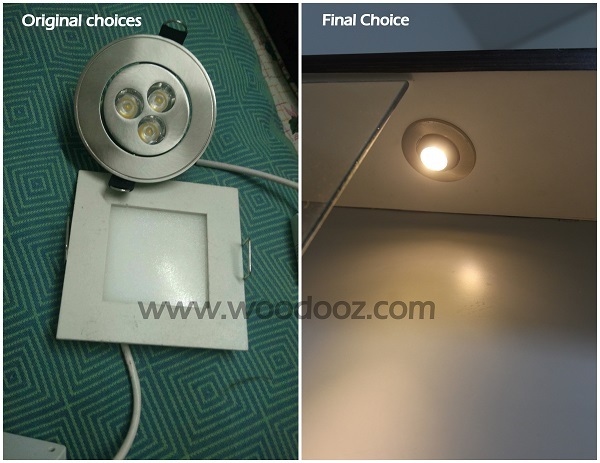 I will shortly (In 2-3 days time) follow up this post with what I have used for making the steps and the cost involved. 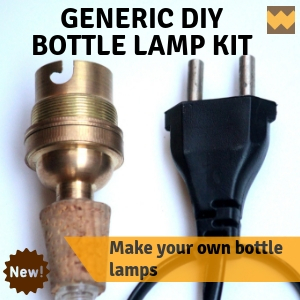 Meanwhile, you will have to tell me if this DIY will be of any use to you at all ? 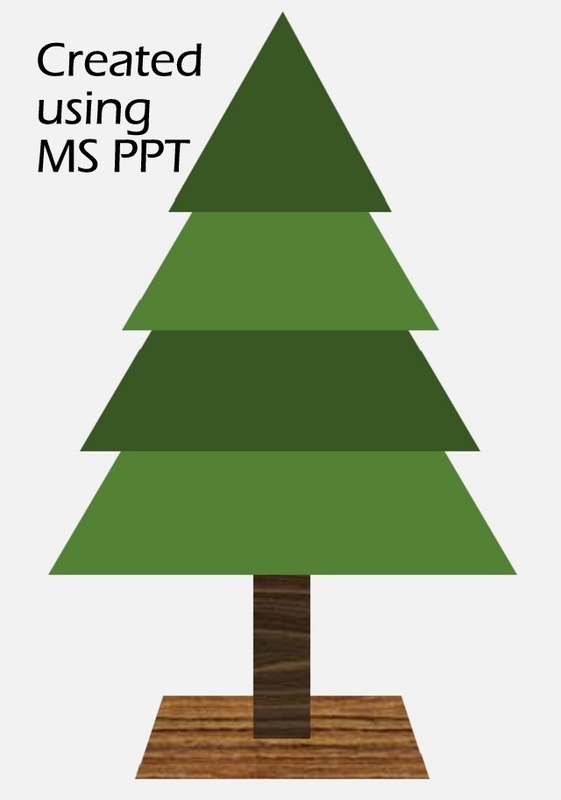 Would you be prompted to go ahead and try this out for this festive season ? Let me know in the comments section.